Frozen Cocktails, Mocktails, Hawaiian Shaved Ice and Grattachecca (shaved ice with fresh fruit) Inside or outside we can make frozen iced drinks using our mobile shaved ice machine maker. 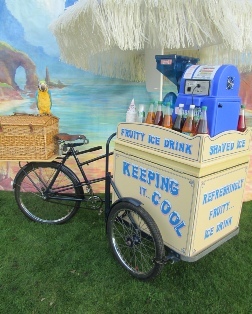 The 12 volt machine shaves the ice for the fruity iced drinks, the Hawaiin shaved ice, Snowy Cones and the cocktails. 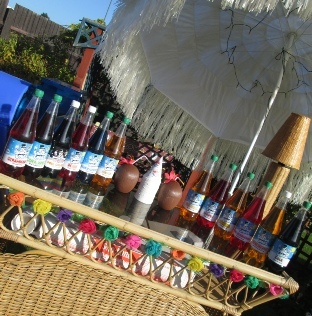 All the drinks can be Flavoured and (corporate) coloured, then served from our Hawaiian themed Bar, A stylish Italian Cocktail Bar, from the mobile refreshment cart / bicycle or from any given area upon your trade Stand. You will be impressed with the range of flavoured syrups available. This chilled drink Service will keep your clients sipping for ages as if they are your best friend. 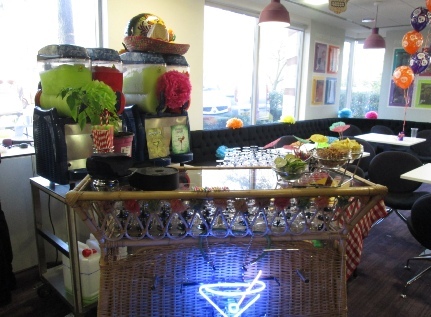 A Drinks Bar for an exhibition trade stand or as conference break-out refreshments. Alexandra Palace, Business Design Centre, Beaumont Estate, Bournemouth International Centre, Donington Exhibition Centre, The Runnymede-on-Thames, Epsom Downs Racecourse, ExCeL, Donington Park, Royal Windsor Racecourse, Missenden Abbey, Highclere Castle, Ascot Racecourse, Kempton Park Racecourse, Hilton Brighton Metropole Hotel, The Elvetham Hotel, O2 Arena, National Exhibition Centre, Ascot Racecourse, Stoneleigh Park, Olympia, Queen Elizabeth II Conference Centre, Bisham Abbey, Sandown Park Exhibition and Conference Centre, Kew Gardens, The Brighton Centre, Salvill Court Hotel and Spa, Great Fosters.